A leader in solar energy installation and service wanted a website to clearly and quickly motivate potential new customers to explore the financial and environmental benefits of solar products and take advantage of free inspections and maintenance of existing installations. Our solution was a SEO-friendly responsive custom site with strong content and no hype. 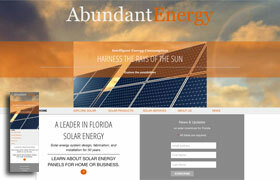 Florida is the sunshine state, but still ranks beneath the top 10% of installed solar capacity in the U.S. For that reason, we built a communication system using site content, links, blogs, and social media to educate and encourage visitors to learn more and get engaged with ballot initiatives for Florida solar incentives.